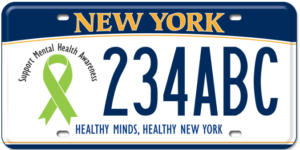 Mental health education is now mandated in New York state schools — that’s going to prove one of the most valuable lessons students grow up learning. The education, still a work in progress, is to be infused into the broader health curriculum starting in kindergarten and continuing right through students’ senior year. That’s such a smart move: Kids should absorb knowledge of mental health from an early age. And hopefully, students will take what they learn home, as another vital piece of making sure children receive treatment when needed is knowledgeable parents. Far too many adults only begin to understand diseases of the brain when they or someone they love is afflicted. Then they’re playing catch-up, struggling to understand the complexities of mental illness and the challenges of treatment. Ignorance of mental-health issues — at any age — can leave a person suffering needlessly, can delay vital treatment. And remember, mental illness can be fatal. A lack of understanding can ultimately lead to suicide. New York state passed the mandate in 2015, but an amendment to the regulations came out last May, according to Paul Savage, superintendent of AuSable Valley Central School District. “It will take some time to fully implement K-12 but it is viewed as an important aspect of our educational programs and is highly valued by our school district,” Mr. Savage told us. Schools around the region, around the state are at that point, too. They need all the resources, all the support available to implement their programs. Their biggest resource is the New York Mental Health Association’s School Mental Health and Training Resource Center, which was established last year with $1 million in state funds. It has been working with educators to develop sample lesson plans and conducts training sessions at school districts around the state. This month, according to a recent story by Zachary Matson in the Schenectady Gazette, Mental Health 101 seminars are educating teachers not only how to identify students’ mental health issues, but how to address them appropriately. The Mental Health Association hopes to keep the Resource Center rolling, even expand it, Matson wrote, but the governor’s executive budget includes just $500,000 for it this year. That’s not enough, when there’s still so much work to be done by the center to ready schools to meet the requirements for mental health education. “This was not going to be one-and-done, overnight and schools are in compliance,” John Richter, director of public policy for the Mental Health Association, said in an interview with the Gazette earlier this month. How important is this addition to curriculum? Here’s what the Gazette says: “As schools grapple with the rising mental health needs of youth, advocates of the mental health education law hope it will serve as the foundation for teaching students about how to recognize mental health challenges not only in themselves, but in their families and friends as well. We urge our North Country leaders in Albany to fight for more Resource Center funding. A mandate is only as good as the process that puts it in place and supports it in the future. And this is one that is undeniably critical to our young people and their families. 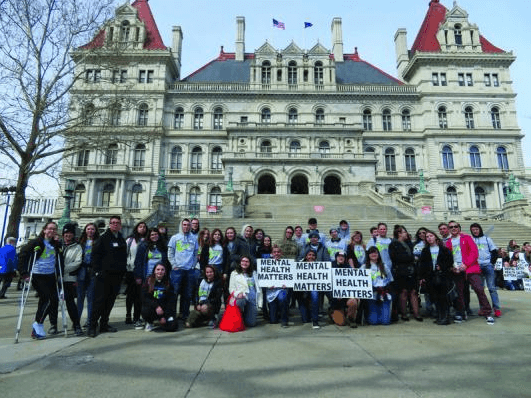 ALBANY — Students from Catskill Central School District and Cairo-Durham Central School District in Greene County traveled to Albany on March 13 for Mental Health Matters Day, a legislative advocacy event organized by the Mental Health Association in New York State (MHANYS). The students were among the more than 300 youngsters and 150 mental health professionals and advocates who came together to call for further state action to support the mental health needs of New Yorkers. Three key issue areas — mental health education, workforce needs and housing — remained the focus of advocacy in meetings with state legislators and during a rally at the Capitol. Students shared their experiences with lawmakers to help them understand the importance of ongoing investment to address mental health in schools, and mental health professionals emphasized the need for cost-of-living adjustments in wages for the human service workforce and funding for housing for people with mental illness or those in recovery. This was the first Mental Health Matters Day since the state law, which requires mental health instruction in all K-12 schools, went into effect. To help schools adopt the law’s requirements, MHANYS launched the School Mental Health Resource & Training Center last summer to provide educators and school districts with assistance and guidance as they develop new curriculum and create programs to support student mental health. To sustain the School Mental Health Center’s impact, MHANYS is now pushing for $1 million in state funding—which matches the budget allocation it received in 2018—to keep the center fully operational in the year ahead. “To educate a student in public school, the average cost is about $22,000 per year. For only an additional 33 cents per student, the School Mental Health Center is able to provide schools with the support and assistance they need to educate youth, families and staff about mental health. It’s a small yet critical investment that will improve the health and safety of students and communities,” said MHANYS Public Policy Director John Richter. In advocating for the School Mental Health Center and its entire Mental Health Matters Day legislative agenda, MHANYS has found partners in the state Legislature and governor’s administration who understand the importance of promoting mental wellness and ending the stigma related to mental illness.